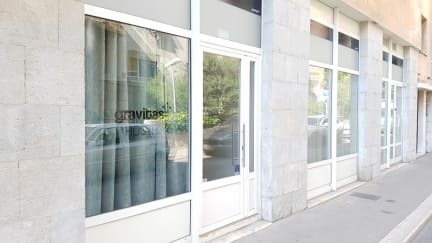 Gravitas Hostel is a brand new modern hostel located in the heart of Split. Everything that Split has to offer is right next door, including protected UNESCO World Heritage zone. Our staff consists of experienced locals that will help you with everything you need, including making arrangements and providing essential information. The Hostel is located on the ground level and has a direct street entrance. Right around the corner there are multiple markets, cafe bars, restaurants, fast foods, bakeries, laundry service, ATMs, Bus stops and everything else you may need during your stay in Split. There are two large paid city parking zones in the close vicinity. Gravitas Hostel itself features two large mixed dormitory rooms, large common room great for socialising and meeting new people, two sweet and always clean gender divided bathrooms. We DO NOT have a kitchen, but we do have a refrigerator, microwave, grill toaster and a electric kettle. Hostel is also surrounded by many markets and food shops. Payment upon arrival by cash, credit cards, debit cards, charge cards (by maestro/visa/mastercard). Taxes not included - city tax 8.00 HRK (1.07EUR) per person per night. By far the best hostel I’ve stayed in as I traveled Europe. The beds were clean, comfy, and spacious. All the other amenities were amazing as well! The location was 5 Minutes from the town center, the lockers were huge and free, lastly the other people in the hostel were really nice. What really made this hostel great was Boris (owner) was super accommodating. Had great recommendations from where to eat to where to visit. Also, really cool guy to talk to as well. Super clean, comfortable, and very affordable. 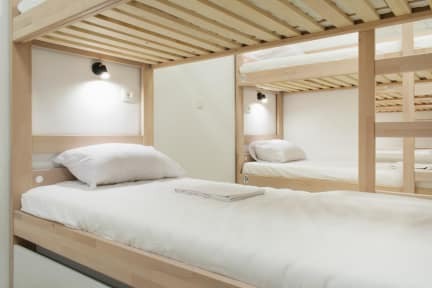 Spacious lockers right under the bed that fit a whole suitcase. Great location right next to the main strip. Boris (the owner) is the man! Great hostel. Clean, cheap, nice atmosphere and very friendly host. Super close to everything, very comfy beds and impeccably clean. Loved it so much that i stayed for a week! Boris who owns and runs the hostel is extremely kind and helpful. A friend and I drove into the city and he assisted us with finding parking nearby to the hostel, in addition to giving great recommendations. Gravitas hostel facilities are some of the newest/best I've ever seen, and the hostel location is wonderful too. Only a 5-10 minute walk to the sea and the Old Town. Boris the owner was great! Very friendly and accommodating. I was unlucky to have a roommate that stinks so bad and he did everything to make my stay comfortable. He put the ventilation on full blast for better air circulation and even talked to the dude to take a shower so my second night was more bearable. The female bathroom is clean although I find it too tight. I wonder how it is during peak season. I like that there is a shower caddy to put your toiletries in instead of the floor. This hostel has serious security issues. Nobody is available in the hostel most of the time and therefore cannot help you if you get into trouble. This hostel needs to work on it's security and staff presence.